It might have been the name that drew me in. The Original Cheese Zombie Sandwiches. It was the wholehearted endorsement of those who had grown up on The Original Cheese Zombie Sandwiches that hooked me. A Cheese Zombie is a sheet tray of home-made bread layered with an oozy, gooey American cheese and Cheese Zombies are sooo much better than they sound. The last time I made Original Cheese Zombie Sandwiches, I made 1/3 plain cheese, 1/3 with pickled Jalapenos and 1/3 with ham. The possibilities are endless. The Original Cheese Zombie Sandwiches are the kind of nostalgic down-home recipe that by all rights should be awful yet somehow is a magical alchemy of oooey, gooey deliciousness. 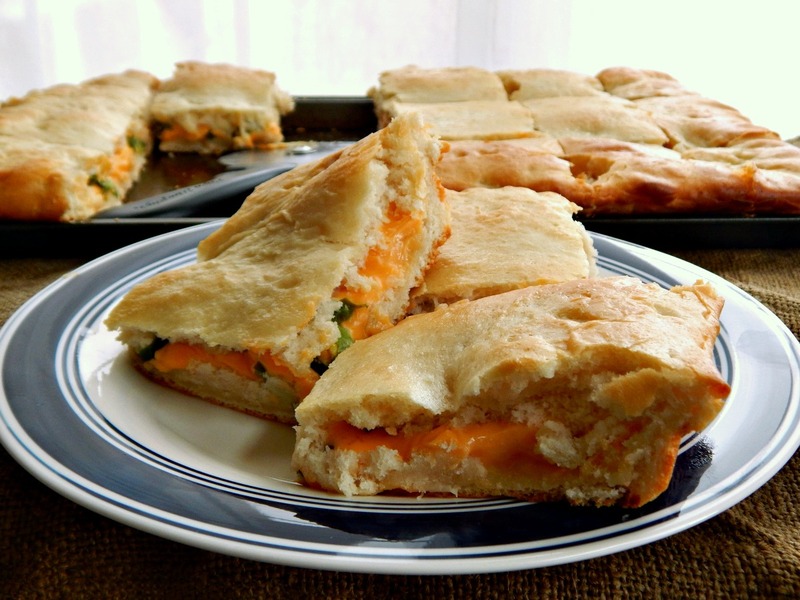 That suspicious orange cheese melds right into the home-made bread…and that homemade bread is just a beautiful thing, all soft, pillowy and warm, and oh my gosh are these Cheese Zombies good. And while they may not be considered “gourmet” good, I think many of us can relate to this: Original Cheese Zombie Sandwiches are ballpark hot dogs good. Theater popcorn good. Fried cheese-curds at the fair good. They’re gas station nachos at 2:00 a.m. after the bar closes good. Hey, I’m not admitting anything and that was way over 25 years ago! For many, it seems the Original Cheese Zombie Sandwiches are the ultimate comfort food, maybe in the way that comfort food relates to childhood memories. The Original Cheese Zombie Sandwiches seems to have its origins in hot lunches made from an excess of government cheese available to the school’s hot lunch programs, way back in the day. They’re particular to areas along the west coast, mostly in California but extending north into Oregon. And believe me, the Cheese Zombie is much beloved by those privileged enough to be served these sandwiches for hot lunch. Just google it! I suspect The Original Cheese Zombie Sandwiches have roots in the Bierock or Runza shown in the photo, below. The dough and the concept seem quite similar, even though whatever lunch lady first made these may have taken liberties in making one huge pan rather than individual rolls. That being said, I recently came across some Russian posts with pans of filled bread that looked a lot like these, made with all kinds of fillings, not just cheese, proving again, there’s nothing new in the world, lol! And who knows, just maybe that same lunch lady may have taken liberties with the Runza name and morphed it to Zombie to intrigue the hot lunch crowd. Patty’s Original Cheese Zombie makes individual Zombies that really look a LOT like an individual home-made Runza or Bierock. Anyhoo, that’s my theory and I’m sticking to it, although we may never know the full truth! When Dorothy Lucille Finch passed away in May of 2012, her obituary stated is was she who invented the Cheese Zombie. Another mentioned that it was not possible, and her Great Grandmother who turns 100 in January and has a certificate from Betty Crocker is the original seller of the recipe to the MDUSD back in the 1940’s. MDUSD is Mount Diablo Unified School District (MDUSD), a public school district in Contra Costa County, California. Freshly Baked Runza – you can’t imagine how good they smell! The recipes floating around for the Original Cheese Zombie Sandwiches are obviously cut back from a larger one & have odd measurements. I modified slightly to conform to the amount of yeast in one packet. I fiddled a bit & updated the process. The yeast is added first, then the sugar, oil and powdered milk so the milk will dissolve. Last of all the flour and salt (which can retard the yeast if added too soon) are mixed in. If you don’t have a thermometer (they’re really inexpensive these days) put a dab of the water on the inside of your wrists. It should feel close in temperature and only very slightly warm. For best results, use powdered milk and add after the yeast has proofed (sat until bubbly) for a few minutes. There are long and complicated scientific reasons that I can never explain, and much discussion of why powdered milk does or doesn’t work better than just plain old milk. The powdered milk makes the dough softer and helps it brown to the beautiful golden color and in this recipe, the amount of dry powdered milk is a higher concentration than plain old milk will give if substituted for the water. If you do have to use regular milk, scald it (heat until a few tiny bubbles are forming at the pan’s edges) and cool it to 110 degrees before using. The Cheese Zombie is an ideal medium for all kinds of add-ins and changeups. I’ve used Velveeta which is readily available but the standard “American Cheese” found in delis might be closer to the original. There is a difference between the very melty Velveeta and a deli type “American” cheese, which isn’t quite so plasticky. Some say the Costco Kirkland Cheese is very close to the taste of the government cheese. But why not make it your own and add in whatever kind of cheese you’d like? And while you’re at it, any additions you’d like? I used some of my leftover Not Your Father’s Root Beer & Bourbon Glazed Ham for some of these and added pickled Jalapeno to some, too. The Original Zombie Sandwich, by the way, is my answer to National Grilled Cheese Day, which was on April 12th. Missed it again, darn it all!! And while we loved the Original Cheese Zombie Sandwiches for lunch, we’ve also started eating variations of the Zombie for breakfast sandwiches. Just freeze slices and once frozen add them to a Ziploc. Come breakfast time, wrap a Zombie in a napkin or paper towel and then heat in the microwave. Reheating instructions are in the recipe. In a large mixing bowl, mix yeast with water, let sit five minutes until it begins to get bubbly. Add the sugar, oil and powdered milk and mix on low with a paddle attachment. Divide into 2 equal parts, form each into a ball. Place each in a bowl sprayed with cooking spray or coated with oil, smooth side down, turning the smooth side back up (so it is covered with a light coating of the oil). Cover the bowl with plastic wrap and let rise in warm place for an hour or so until doubled in size. When risen, save the plastic wrap to cover the tray of Zombies while it rises. On a lightly sprayed or oiled half sheet pan (17 x 12 x 1), stretch one ball of dough evenly to the edges and slightly above. Top with sliced cheese and any other filling if using. Take the second ball and stretch it out on a counter next to the tray so it is a rectangle several inches smaller than the tray. Pick it up (it will hopefully just stretch to about the size of the tray as you do so) and place over the top of the cheese. Gently, trying not to disturb the cheese, stretch and pinch the edges of the top layer to the bottom, sealing well. Cover lightly with plastic wrap and let rest until doubled in size, about 30 minutes to an hour. Bake 18-20 minutes at 400 degrees until the top is golden brown, rotating the tray about 3/4’s way through. Remove from oven and brush with butter, let cool several minutes, slice and serve. Scant 1/2 cup – just short the measurements by about a tablespoon. Butter – the easiest way to brush with butter is to open a stick of cold butter and rub the end across the top of the hot dough. Yeast – 2 3/4 tablespoon is slightly more than three packets, but is the measurement I use. If you’re using packets, it isn’t worth opening a 4th packet for the little bit of extra yeast. This seems like a lot of cheese, but don’t skimp or they’re really not as good. All kinds of add-ins or changeups can be made to the original filling. Just be sure to use a good melty cheese. Zombies may be reheated in the microwave. Wrap in a napkin or paper towel, heat on 70 percent power for one minute, then turn and cook on high for 30 seconds. Zombies may be frozen, then wrapped, for later. Reheat from frozen, as above, on 70 percent power for one minute, then turn and cook on high for 45 seconds. This entry was posted in Click here for Bargain Meals, Click here for Fabulous Food Posts and tagged Bargain Meal of the Week, Bread, Breakfast or Brunch Dish, Cheese, Freezes Well, Ham, leftover ham, National Grilled Cheese Day, Original Cheese Zombies, Sandwiches, Velveeta. Bookmark the permalink. Cheese zombies made it into Washington State. They were a staple in the elementary school where I taught in the 70’s in Yakima, Wa. Keep in mind that the processed cheese of the 70’s was a different product than what is on the shelf now. Most if it isn’t even made with milk. Oh, gosh, I wish they had them where I grew up! I cannot remember anything memorable about our school lunches in high school, although in Elementary school we had the BEST lunch ladies! I remember what that cheese was like; I keep hearing the Coscto Kirkland is similar but haven’t gotten it myself yet to try! I had a neighbor who I babysat sometimes for back in the 70’s and would get these huge blocks of cheese. I loved it! But I do hafta admit, I like this with velveeta, but then I was always a sucker for a grilled cheese with velveeta…not too sophisticated, I know! Tried this different bread recipe and mixed it a diff way with all my dry ingredients first then wet. Had to add 1 cup of flour but by far the best ones I’ve ever made. Thanks. Hi Jessica, thanks for stopping by and giving me the feedback! They ARE good, aren’t they?! I’m a concerned you had to add a whole cup of flour because that’s a significant difference. I often notice in the winter when I make bread, with the low humidity and the resulting dryer flour, I’ll need to add a little more moisture rather than more flour! I’ll remake these in the next couple weeks to double check my measurements. Everyone says baking is a science, but it’s also an art. And when you bake bread you get a feel for when the dough is right. I usually put a note on my bread recipes to watch for the dough climbing up the hook, which is a sign it might need a bit more water, or not forming into a ball which means more flour is needed. I’ll add that to the recipe! lol! Yes the cheesiest recipe I’ve made! Gosh they were so good! I could totally devour these after a night of too much beer but now that I have kids, I don’t do that anymore or I pay heavily in the morning with screaming toddlers. I love that they are made with homemade bread.! Yum! Yep, I agree 100 percent – especially now that I’m a grandma! Plus I get pretty silly after one beer…or one glass of wine! These would be great for the kids, btw!! Thanks, Rhonda! I think any kid would love these…I was surprised how much we liked them, here! As a matter of fact, I froze some of the last batch and the folks microwaved them for breakfast…which is funny because I thought this recipe could be adapted for a breakfast sandwich. Maybe a little sausage and some egg….well, I’ll have to think about that one! OK, that’s a great idea Mollie! I’m always looking for new breakfast ideas for when kids are here– so much French toast!! nice to have something new… Happy weekend friend! What are you up to?? lady! I am fasting today and soooo hungry, then I foolishly drop by your blog and see cheese! Cheese! CHEESE!!! I want this whole damn tray and I want it now. lol, Mum! I bet you and the Misses would LOVE these! That bread is so good and then there’s that cheeeeeeeese!! Hi Barbara – I missed your comment so sorry for the late reply! My son loves these (and he’s 25)!! Thanks for the reblog~!I’m sorry to reply so late. I’ve never heard of Zombie sandwiches but it looks delicious! Certainly too good for zombies! I have never heard of cheese zombies, but you definitely have me intrigued. It seems like something we could fall in love with easily enough! Oh, Carlee, they were fun! They’d be great for a movie night or sleep over! Wow Mollie – the first I’ve heard of cheese zombies – they look fantastic! But these Cheese Zombies – worth the wait, lol!! Thanks, Jhuls! I have never in my life heard of Cheese Zombies until just now! 😮 They look intriguing. I grew up in Texas, which must explain my lack of knowledge. I see this as a good potluck dish! You know, i think it would be a good potluck dish. Or a great dish for sleep overs for tweens or teens! Oh, and there’s no Zombie police out there (yet?) if you want to make Zombies with frozen bread dough!